Grace O'Malley | Take Back Halloween! To the English, she was Grace O’Malley (1530-1603), notorious pirate. To the Irish, she was Gráinne Ní Mháille, Queen of Clew Bay, and her crews were just collecting taxes from the ships that entered her waters. True, these “taxes” were collected at the point of a sword by armed boarding parties of sailors who behaved an awful lot like pirates, but hey, a queen’s gotta do what a queen’s gotta do. Especially when her country is being invaded and colonized by a foreign power, which is exactly what was happening. The backdrop to Grace O’Malley’s piracy was the ongoing English conquest of Ireland. Traditional clan chieftains like Grace were being pushed to the edge, their power under constant attack from the English overlords. The most famous incident in Grace’s life—her meeting with Elizabeth I—was a direct result of this persecution. When the English governor took Grace’s son captive, Grace boldly sailed to England to petition Elizabeth for his release. The amazing thing is that she succeeded. Elizabeth seems to have taken a liking to the Irish woman, perhaps sensing in her a kindred spirit. She promptly wrote to the governor in Ireland, instructing him to release Grace’s son and to henceforth treat Grace O’Malley as a friend of the crown. 1. Yellow chemise. Also available here and here . The Irish chemise, or leine, was the basic national garment. By the 16th century it was dyed saffron and had big baggy sleeves—a style the English thought looked absolutely horrible. That probably made the Irish love it even more. 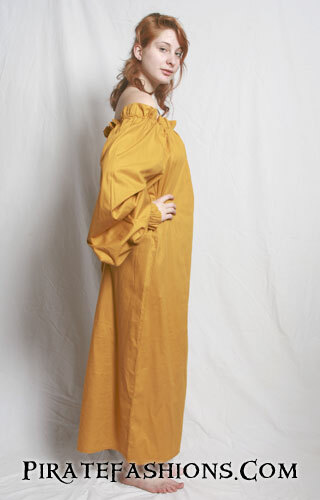 This reenactment chemise in mustard yellow is the closest thing we can find ready-made. 2. 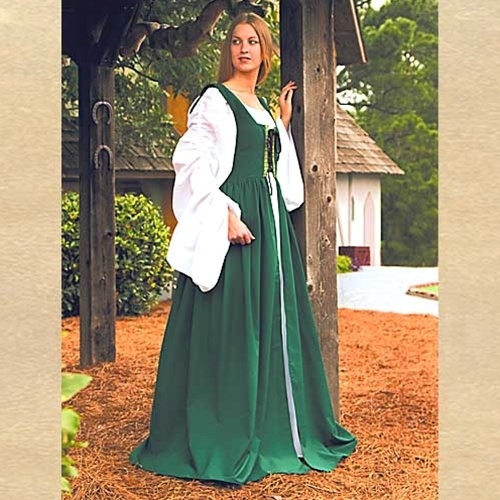 Fair Maiden Dress in green. Also available here. The fashion in Ireland was for a gown with a full pleated skirt, a loosely laced bodice, and peculiar open sleeves that allowed the sleeves of the leine to hang through. The Shinrone gown is the key piece of archaeological evidence for the period (details here); we include a drawing of it in our main illustration. You can’t find a dress like that for sale, so we’re substituting this Ren Faire gown. The main thing it’s missing is the sleeves. It’s workable, though; just make sure you pin the skirt closed all the way down. A boatload of safety pins will do the trick. 3. 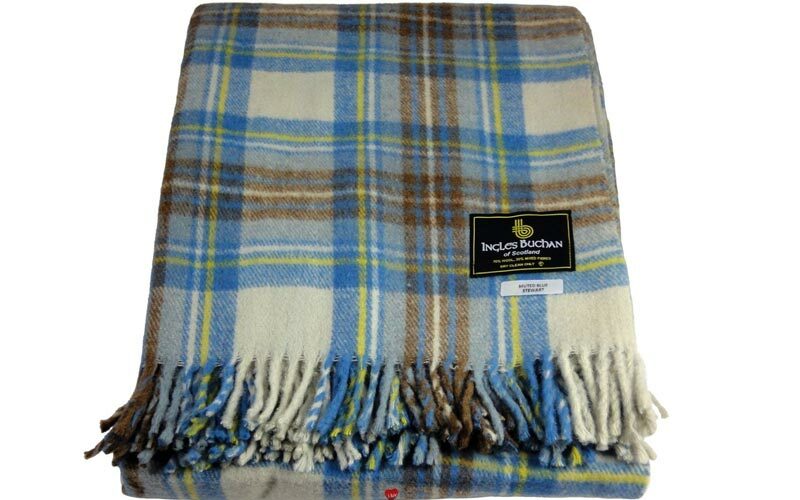 Wool throw in muted Stewart tartan to use as a cloak. The Irish cloak, or brat, was a thick wool rectangle or semi-circle edged in heavy fringe. We chose plaid because it’s pretty, but checks, stripes, or solids would also be appropriate. (Don’t worry about the fact that this pattern is named after the Stewarts. Gaels and other Celts have been enjoying plaid since the Iron Age, long before the 19th century fad for assigning particular tartans to Scottish clans.) If you don’t have a nice wool throw you can use, just get a couple of yards of inexpensive fleece fabric (like this ) and attach some fringe (like this) to the edge with adhesive hem tape. Contrasting fringe is actually good, since the Irish fashion was to beef up the fringe until it almost looked like a fur edging. 4. 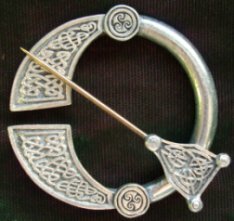 Penannular brooch. To fasten your cloak at the neck. 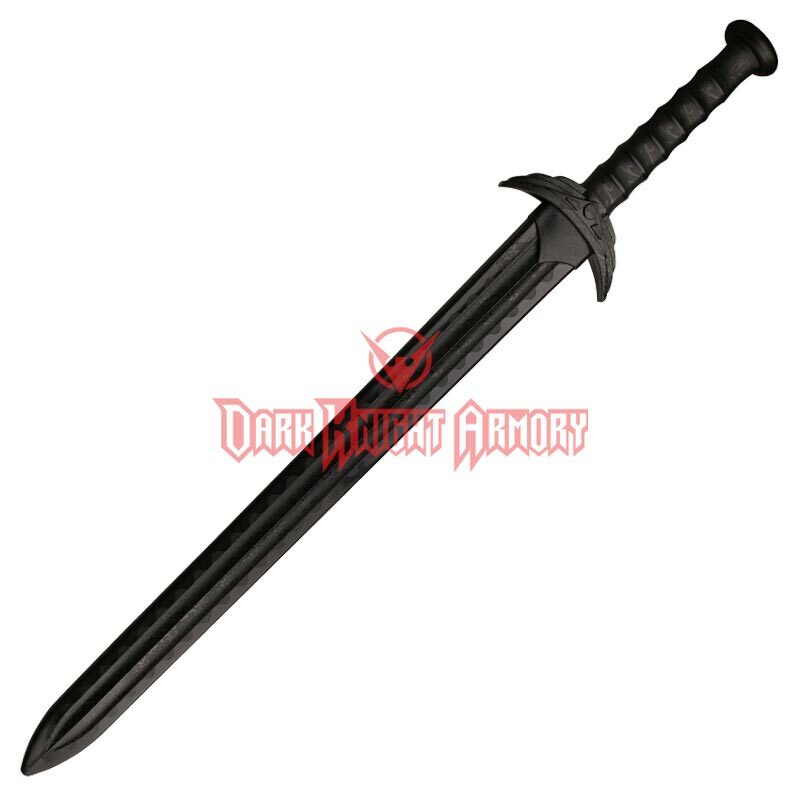 The one we show is the large 3-inch size, listed at the bottom of the page. 5. Double wrap belt. 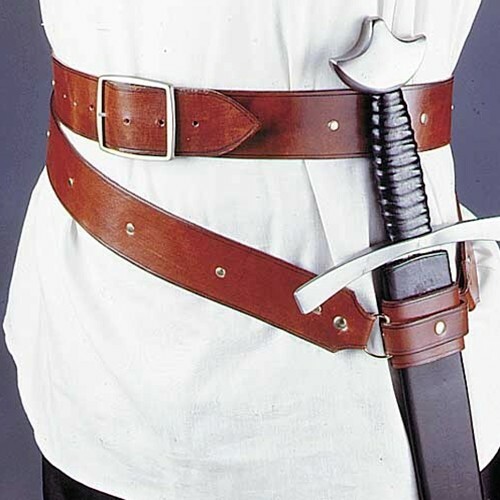 To hold your sword, naturally. 6. Synthetic broadsword. It’s molded polypropylene, so you won’t do any damage with this thing. But it looks nice. Shoes: Wear flat leather boots or booties. Nothing fancy; no bucket boots à la Pirates of the Caribbean. Wrong century. Illustration credits: The drawing of the Shinrone gown is from the pattern by Kass McGann. The statue of Grace O’Malley is by the artist Michael Cooper, and stands on the grounds of Westport House, the County Mayo home of Grace’s descendants. The illustration of Grace O’Malley meeting Queen Elizabeth I is from the frontispiece of the Anthologia Hibernica, published in 1793. 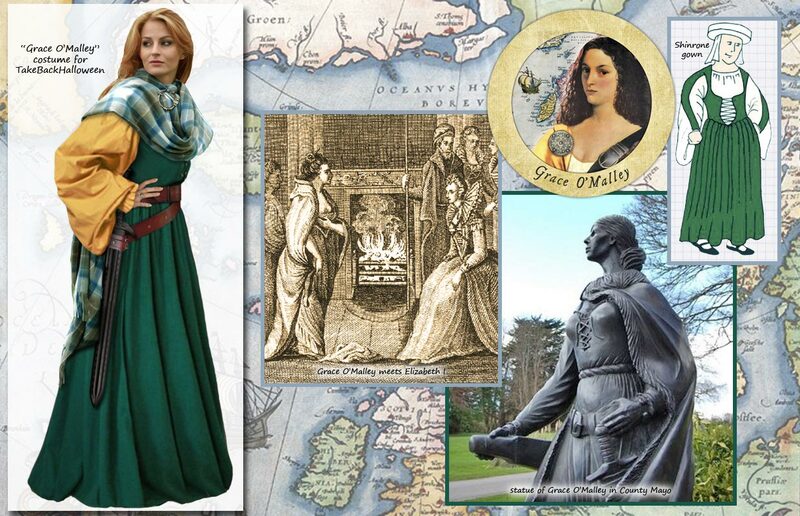 The small round portrait is from the cover of the children’s edition of Granuaile: Sea Queen of Ireland, written by Anne Chambers and illustrated by Deirdre O’Neill.